Thanks for Choosing DISH Protect! If you experience any issues entering your activation code, try copying and pasting directly into the activation code field in the installation window. The easiest way to manage security for your devices, whether you have one machine or several, is at your fingertips. Access protection information and cloud-based features from any computer – anywhere. Open your browser and go to my.webrootanywhere.com and click Sign up now. Enter your account details and register. You will receive a confirmation email at the address you provided. Follow the instructions in the email to confirm your account. 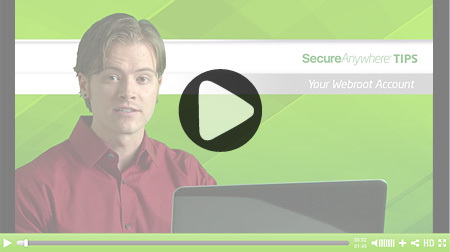 When prompted, enter your Webroot account credentials to log in. How do I setup or configure Webroot once it is installed? For a typical user there is no additional setup needed. Webroot Internet Security installs fully configured and optimized to provide protection without inturupting or slowing you down. Users with additional configuration needs can access advanced options through the settings link in the upper right corner of the main interface. I want to install Webroot Internet Security on a PC, Mac, and mobile devices, will I need different activation codes? The activation code you received with purchase of Webroot Internet Security will work for all your device types including PC, Mac, Android and iOS devices. Do I need to update files definitions for Webroot Internet Security? Webroot is a cloud based security solution so it is always up-to-date and doesn’t interrupt or slow you down with the need for defintion updates. The Webroot analysis engine reads real-time feeds of threat data from over 30 million devices providing a current view of threats and enabling instantaneous protection from new infections. No matter where you are, the Webroot Management website enables you to view and manage the security status of your PC's and mobile devices as well as utilize your password management features. Your account can be created and the website accessed from my.webrootanywhere.com. How do I access password management features for Webroot Internet Security? On each computer with Webroot installed, open the main interface (double-click the Webroot icon in the system tray), click Identity & Privacy, then click the Password Management tab. If a Download and Install button appears, click the button to install the components. Password management also needs to be setup through the Webroot Internet Security portal. Create your portal account, login to the portal and select to "Set Up Account Now" on the Passwords panel. See the Passwords User Guide for more detail. How do I transfer my subscription to a new device? Webroot SecureAnywhere is a multi user license allowing you to use your license on up to 3 devices. If you are using the maximum number of devices you will need to uninstall from the old device prior to installing on the new device. Locate the activation code on your current device and write it down. Open the main interface by clicking on the Webroot® icon in the system tray. Click on the "My Account" tab to view and copy your activation code. The activation code is a string of 20 alphanumeric characters. It is unique and holds the information about your subscription. To uninstall the Webroot software, go to the Windows Start menu, type in “programs and Features” in the search box, select the Webroot software, and select the Uninstall option. From your new device got to www.webroot.com/safe to download and install Webroot on your new machine. What are the supported platforms and system requirements for Webroot SecureAnywhere? Mac OS® X v. 10.8 "Mountain Lion"
Mac OS X® v.10.9 "Mavericks"
Mac OS X® v.10.10 "Yosemite"
Mac OS X® v.10.11.1 "El Capitan"
Q: My PC is running slowly. What can I do to improve performance? A: The System Optimizer located on the Utilities screen removes unnecessary files, freeing up space on your hard drive to improve overall performance. It also protects your privacy and security by erasing your internet tracks. Q: How do I find my activation code in Webroot SecureAnywhere? A: Open the main interface by clicking on the Webroot® icon in the system tray. Click on the "My Account" tab to view and copy your activation code. Q: Where can I access scan logs to help troubleshoot issues? A: Scan logs are accessible through the main interface. Open the main interface by clicking on the Webroot icon in the system tray. Click on the Utilities tab and click on the Reports button to save and view the scan log. Q: I cannot locate my activation code. Where is it? A: You can locate your activation code in the email provided by DISH. Please check your spam folder if you cannot locate this in your inbox. If you are unable to locate this, please contact DISH at 866-344-2484. Not finding the answers you need? Contact us for additional assistance. When prompted, enter the activation code found in your email from DISH. Search for Webroot Security Free and install the app (You will be using the activation code on the back of your security package to upgrade from our Free to Premier app). Tap Activate to enter your activation code.